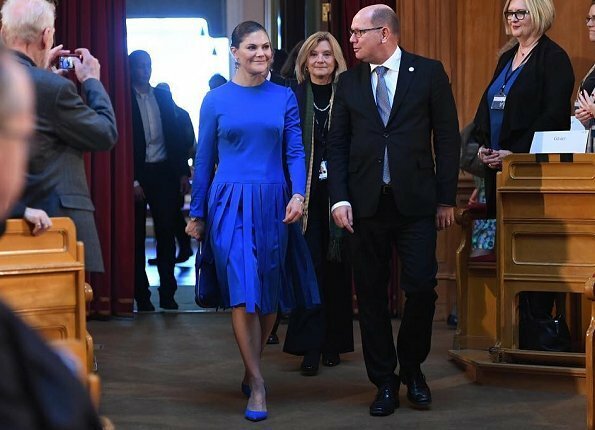 On October 18, 2017, Crown Princess Victoria of Sweden attended a seminar at the Parliament of Sweden (Riksdag) in connection with the centenary of Finnish Independence in Stockholm, Sweden. 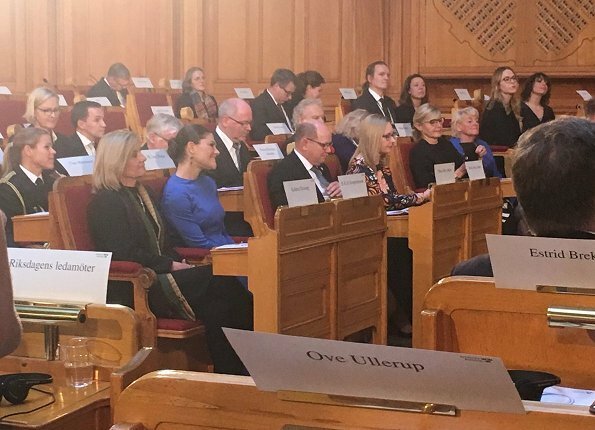 Sveriges Riksdag held a seminar to mark Finland's 100 years as an independent state. What a nice surprise! Love this one, great color, she looks very good. Very nice! Glad you shared your insight. And I want that Stella clutch! Surprised that I find this dress intriguing. It's the second picture that I keep studying. The color is vibrant and it appears to move well. I like this drop waist although the 80s may be calling. Nice to see her in a softer look. And the colour suits her. I agree! 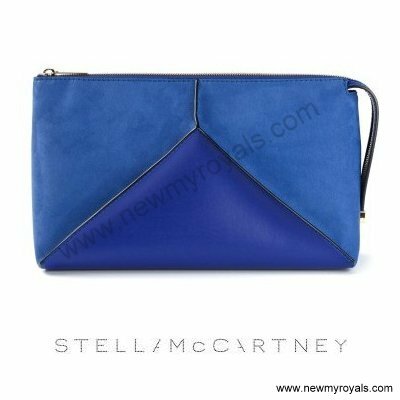 This royal blue is very much a colour for Victoria. Does Victoria ever wear her hair down? I would like to see a picture. I WANT TO SEE SOMETHING DIFFERENT WITH HER HAIR!!!!!!!!!!!!! Wow, she looks great! Wonderful dress and shoes! Nice to see a softer look. But how much nicer it would be if she wore her hair like, say, Letizia's new shorter cut. What a fun idea for a dress with the floating strips around the skirt! It is a lively look. I think the maker of the sleeves could have done a better job, though, because they really wrinkle around her arms. 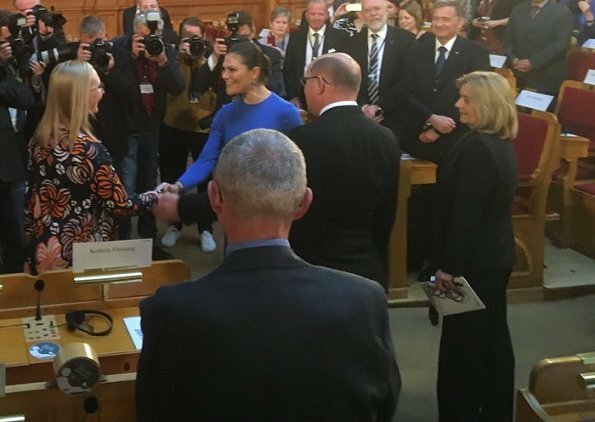 Odd, when you expect that royalty could easily use talented and capable designers and seamstresses, often the fitting is lacking. result seems less than dull. That is so funny comment, yesterday when Stephanie of Lux had dress, shoes and purse all the same grey you wrote: "Formidable! Pursuivre dans cette voie, s'il vous plaît" What is different today? That blue is very important and sensitive thing to us Finns. 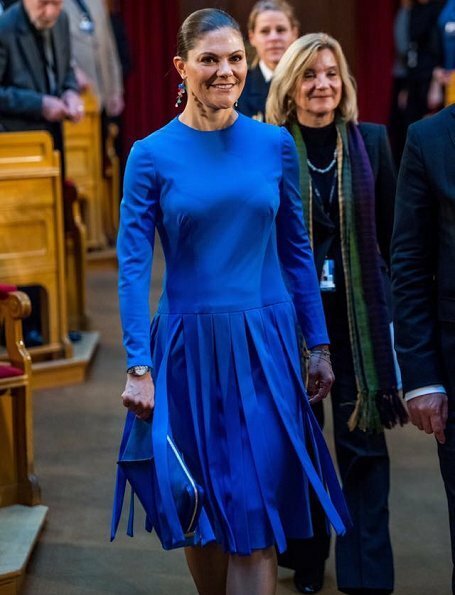 Well, the color is pretty, but personally I find this dress horrible, and seemingly not very well executed on top, perhaps inadequate brassiere, I can't get on board with the matchy-matchy shoes and handbag, too old fashion. That being said, Victoria is a lovely woman that looks attractive even with a plastic bag. That blue is great on her but the dress does not fit well. Wrong choice of bra. She is so charismatic, warm and caring. That's what counts most.